Exeter City manager Paul Tisdale says more of his players must contribute goals to the League Two side. Tom Nichols scored his 10th goal of the season in Saturday's 3-2 win at Mansfield but he is the only player to reach double figures this term. "We want goals in our team, we want goals coming from all angles. We need more than one person thinking about a goal," Tisdale told BBC Radio Devon. "Tom's showing that but I need more. I need other players doing that." 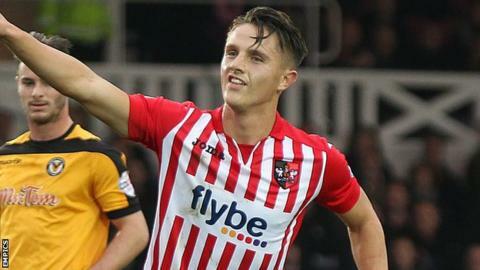 Only Northampton Town (37 goals), Stevenage (37), Cambridge (39) and leaders Wycombe Wanderers (40) have scored more than Exeter City's 36 goals this season, with 11 players netting for the club in League Two this season. "It's not about telling people not to score, it's about saying I want more players scoring," Tisdale added. "It's good for everybody that you get more than one player thinking 'I'm going to score today'. "Tom's in that mode, he's doing really well with it, it was a lovely finish and long may it continue."